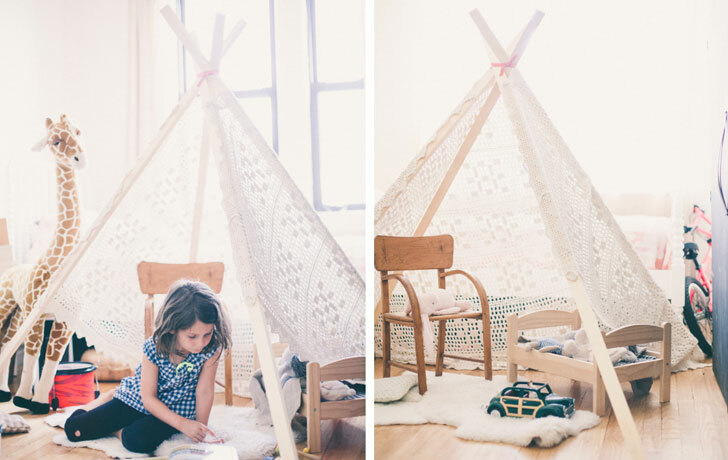 DIY: Build An Adorable Teepee For Your Child For Under $15! Every kid loves to hide away in a tiny space that they can call their own. While forts made from bed sheets are certainly fun, why not create a beautiful teepee for your child that will really stir up his imagination? In just a few simple steps, and with a few easy-to-find materials (four pine boards, an old table cloth, a sanding sponge, some elastic and a pair of scissors), you can build this inspired dwelling in less than 20 minutes and for under $15! But be warned: you’ll probably have to pry your kiddo away from it once she sets up house — get ready for lots of nights “spent in” reading and coloring under this tiny teepee. You can get started on constructing your teepee following these instructions at A Cup of Jo!